TATA distributes Indian VIVO Premier League video. London, UK 2018: NEP Broadcast Solutions and Tata Communications have successfully completed the remote production and broadcast of VIVO Indian Premier League (IPL) for Star Sports, the number one sports broadcaster in India and subsidiary of 21st Century Fox. The 2018 VIVO IPL season was Star Sports’ first since it acquired the global media rights for USD $2.55 billion for the next five years. 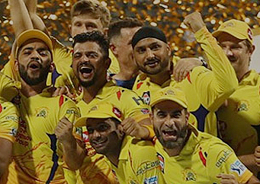 This marks the first time that a sports series of IPL’s scale has been produced remotely in India by harnessing superfast connectivity. The tournament consisted of 60 matches taking place over 50 days in nine cities across India: Mumbai, Delhi, Jaipur, Kolkata, Hyderabad, Chennai, Indore, Mohali and Pune. Each fixture featured customised feeds in local languages including commentary in six languages – which went up to eight languages for the final. To tackle the challenges stemming from the back-to-back schedule of events, the long distances between the match locations, and the need to localise content for different regions, Star Sports worked with Tata Communications and NEP to centralise many of its core operations and manage them remotely from its production hub in Mumbai. This first-of-its-kind remote production initiative brought together NEP’s expertise in the centralised broadcast of live events and Tata Communications’ video distribution capabilities. Star Sports production crew along with NEP’s engineering team, including cameramen, sound assistants, talent producers and the production management team, were on-site at the venues, while the production personnel, including the director, vision mixer, audio engineers, EVS operators, producers and graphics team members, operated out of the central Star Sports facility at Urmi Eastate in Mumbai. With NEP’s new flight pack Broadcast Lite — which allows a quick set-up in minimum space without any compromise in functionality and quality — the team was able to distribute eight unilateral camera feeds and 15 HD host feeds, along with associated AES audio feeds, back to Star Sports’ Mumbai hub. The two NEP teams — often with more than a thousand kilometres between them — were able to collaborate seamlessly and reliably with the Star Sports team enabled by Tata Communications’ ultra-low-latency Video Connect network. With fewer than four frames per second latency and hitless switching capability, this digital infrastructure enabled NEP’s remote production by ensuring the smooth transmission of a combination of signals and camera feeds at each IPL fixture to Star Sports’ Mumbai hub. Remote production can be more cost-effective than conventional onsite production. It allowed Star Sports to efficiently produce customised feeds in multiple languages for different regions, enhancing the viewing experience for the millions of cricket fans following VIVO IPL 2018 across India.